The Red Hook waterfront is quickly evolving into the land of the lofts. One of the more anticipated projects is coming from a UK based developer, EST4TE FOUR (http://estate4.co.uk/). Construction is set to start on their project in 2014 on 160 Imlay, a mixed-use building of contemporary lofts and commercial space, according to AA Studio, the Brooklyn-based design firm working on the project. It’s expected to include a rooftop lounge, parking and 72 residential units. EST4TE FOUR is also converting a warehouse at 202 Coffey into art studios and galleries in addition to a 790,000 square feet commercial /residential project at 68 Ferris Street. The neighborhood is still dominated by low-income families who live in the Red Hook Houses but the gentrification of nearby Carroll Gardens and Gowanus is quickly spilling into Red Hook. Over all, the population of Community Board 6, which includes these three neighborhoods, is attracting more middle- and upper-income people with residences above Fairway, and renovated houses along Van brunt, and on Coffey, and Dykeman. A private school, Basis, is on the horizon, charging $23,000 plus tuition. The community board shot down the plan, arguing it’s not for neighborhood parents, but operators are pushing ahead. Officials say the area really needs a new public school. PS 15 on the rise with more than half of kids meeting reading and math standards, according to city education statistics. Red Hook Neighborhood School is also a popular community school, servicing about 200 elementary school students. The last 18 sales in Red Hook went for a median of $516 per square foot, 3000 sq ft property and $1.5 million, according to streeteasy.com. On rents, it was $40 a square foot, 800 sq feet and $2647. There is still a strong stock of townhouses, compromising most of the sales, while rents were primarily for two bedroom apartments. The Columbia Street Waterfront is rapidly evolving and new developments are easily getting over $1000 SF. Townhouses are getting approximately $647 per square foot, with rentals getting approximately $42 a square foot. Getting to and from Red Hook has always been a challenge for anyone relying on public transportation. The closest subway is the F train at the Smith-Ninth Street Stop that reopened in spring of 2013 after a two-year renovation. The neighborhood also has the New York Water Taxi, a service that runs between Pier 11 in Lower Manhattan and IKEA and there’s been rumor that additional services may come to locations other than IKEA. 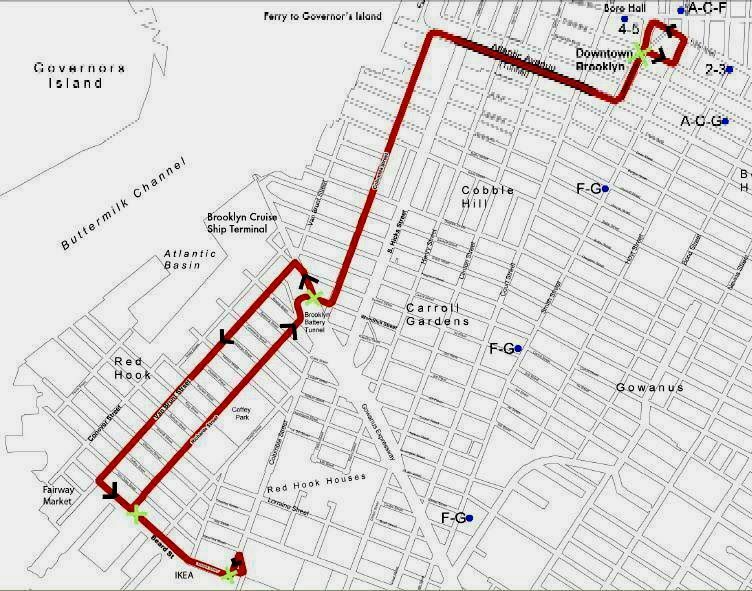 The B61 bus line runs to nearby Gowanus/Park Slope but officials hope the new development in the area leads to more buses and permanent ferry service. Biking is also a popular mode of transportation in the area, although there currently is no Citibike station in Red Hook. I’d like to see a Citibike station here and above ground trolley service to the MTA. The addition of supermarket-giant Fairway Market has serviced the local community in terms of jobs growth and a nearby grocery chain but also brings in people from outside the neighborhood who shop in the smaller retail places. “One of the things we found after Hurricane Sandy was that when Fairway was down, the traffic wasn’t there,” said Carlo Scissura, president of the Brooklyn Chamber of Commerce. The furniture playground, IKEA, also attracts business to the area as well as offers locals an affordable option for home goods. One of my faves is the Chelsea Garden Center. There are some great small shops, like the Botta di Vino wine store, Pier Glass jewelry, Dot Van Brunt street and more are expected to inhabit the 160 Imlay. Red Hook has become a destination spot for foodies. Lines quickly form for Alma, a Mexican restaurant with perfect views of the Manhattan skyline, and The Good Fork, which serves continental with a flair. Prices are not on the low end (dinner entrees at both run $20 and up) but reasonable compared to the same fare in Manhattan. BBQ fans need to look no further than the “Texas Style” smokehouse, Hometown Bar-B-Que. A classic southern tribute on the Red Hook shoreline, Hometown features a full bar and live music in the evenings. There are popular seafood eateries like Brooklyn Crab and Red Hook Lobster Pound as well as a sweet spot, Baked, which attracts patrons from across the Brooklyn Bridge for cookies and the like. On the liquid front, the area boasts the Sixpoint Brewery and a bevy of wine shops. What next: “In the next year to three years you are going to see a bunch of new establishments come on line,” predicts Scissura. Transportation remains the area’s biggest challenge, he says, but he hopes that with the new commercial and residential space being developed that better bus and ferry service will follow. “Then you’ll be able to get more people to the subway and to jobs,” he says.